NEW YORK - Feb. 2, 2019 - PRLog -- A great blurb from Justin Warren at Forbes earlier this week totally nailed it: The big lesson of cloud computing (and this is something some organisations are still struggling to learn) is that it requires changing the way your organisation runs. Therefore you don't simply build for cloud, you operate as a cloud -- that's where successful software spends most of its time. In other words… cloud native is the future. We all know that information technology in the "SuperCloud" is moving fleetly, and you need to stay informed. Luckily, you don't have to spend all day surfing because The SuperCloud Newsletter highlights the latest news related to AWS, Azure, Google Cloud, developers, code, containers, applications, data migration, software, data centers and networks. • What have Containers ever done for Storage and Data? 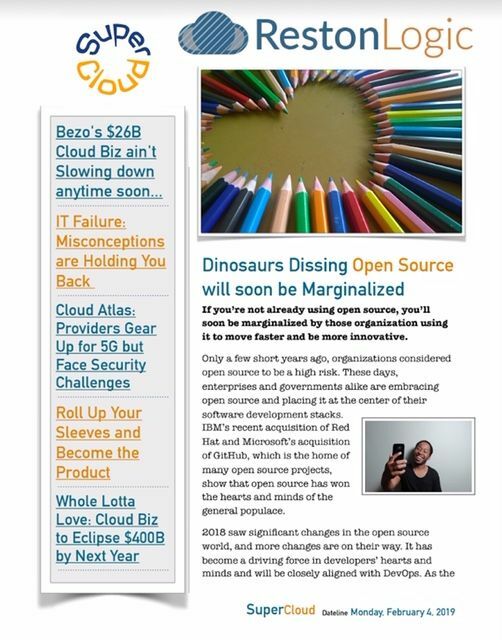 Click over to https://twitter.com/restonlogic to download this week's SuperCloud Newsletter and to catch up with every bit of Hot News from the Cloud. Tech News: EU Copyright War Pits Hollywood vs. Silicon Valley… Will "Internet Culture" Survive?